Solve this challenge, showcase your skills and improve your resume with the verifiable certificate. 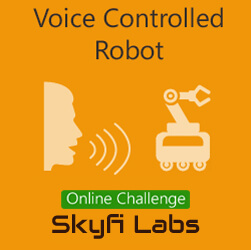 Skyfi Labs Online Challenges provide an unparalleled opportunity for students to showcase their expertise in latest technologies. Students can solve project based challenges at their home/ college and earn certificates. This is a very inexpensive way of showcasing skills and gaining credentials without having to travel. As part of the challenge, the participants have to build a Voice Controlled Robot that is operated using a Mobile Phone App and controlled through Bluetooth Communication. You can use any 8051 microcontroller based development board. You can buy Skyfi Labs 8051 microcontroller based development board. Want to participate but don’t have required knowledge? You can enrol for the Voice Controlled Robot Online Project-based Course get hands-on experience on the project and solve the challenge. Kit will be shipped to your home as part of the course.